Also, it can be embarrassing for staff to ask customers about the experience they have just had, even if it had been outstanding. Our solution was to help create a very short and focussed questionnaire. It was designed to capture the information required but in a very short time to reduce any inconvenience to customers. We hosted the survey on line and interviewing was carried out using a tablet. The questionnaire was mainly closed questions. The key questions used a rating scale, and one of these was the standard Net Promoter Score (NPS) question. It was designed so that a customer need spend less than two minutes with our interviewer but in that time we gathered sufficient quality information to meet the client’s needs. At the conclusion of the project we were able to show the client we spent less than two minutes with over 40% or participants. 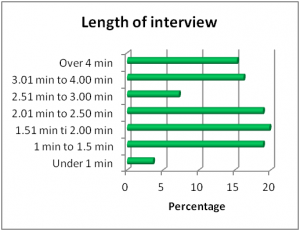 And over 60% of interviews were completed in less than 2 1/2 minutes. This reassured the client that the amount of disruption to their customers’ visit was kept to a minimum. 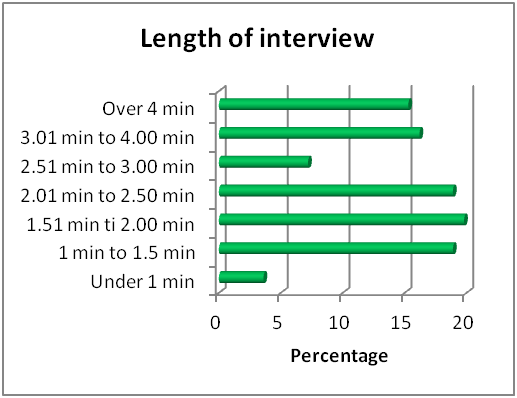 The longer interviews were where customers gave longer responses to the single open ended question at the end of the survey.